This well-known eco-lodge is situated at the end of a valley and surrounded on three sides by the pristine jungle of Piedras Blancas National Park. 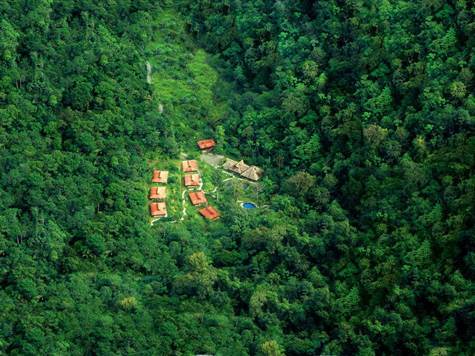 It is the only hotel in this remote national park that is accessible by car all year around. It was listed as one of Costa Rica's five top eco-lodges by Lonely Planet and has earned a Level 3 Certificate of Sustainable from the Costa Rican Tourism Board by protecting the environment, reforesting thousands of rainforest trees, and financing community projects. It is well established through it's website and online reservation system, as well as through hotel search engines. The large property, consisting of a beautiful tropical garden, a fruit and vegetable garden and 25 acres of rainforest, is being inscribed as a private nature reserve and attracts more than 200 species of birds as well as monkeys, wildcats, anteaters and many other mammals. 18 rooms in eight rustic cabins and an exclusive jungle villa, all equipped with private bath, ceiling fan and terrace, sleep up to 40 persons. The pool is fed by a jungle stream and needs neither filter pumps nor chemicals. Hiking, horseback riding and bike tours are offered, as well as boat tours in nearby Golfo Dulce. WIFI satellite Internet, a mini-van, a pick-up and an excursion boat are included. With 4000 guest nights per year and clientele from more than 50 Costa Rican travel agencies, this lodge provides a great opportunity to investors who are committed to conservation and offers high potential to expand on the international tourism market. Owner is selling because he wants to retire and travel.